If it had not been for John Randall’s creation of an MRC Research Unit dedicated to the study of the physical and biological mechanisms of single cell division, the structure of DNA would not have been revealed in the U.K. Most likely it would have been discovered in Linus Pauling’s laboratories in America. 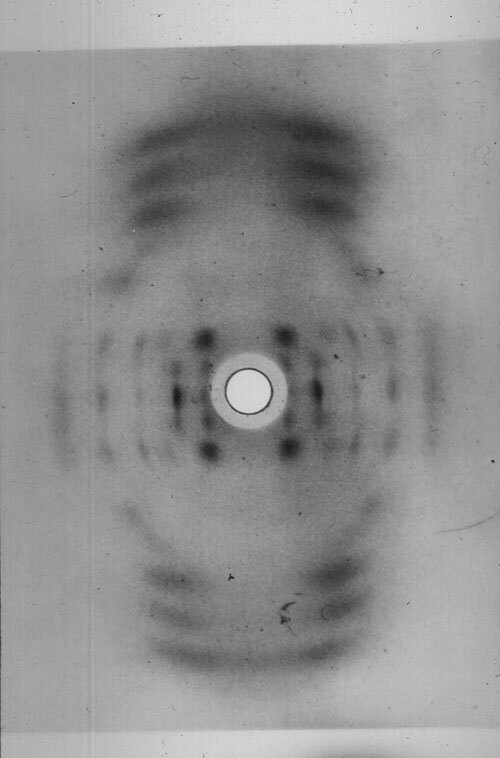 Today, if you asked who discovered the structure of DNA, the response should be: Watson and Crick building atomic models in Cambridge and Wilkins and Franklin et al., exploring x-ray diffraction patterns at Kings College in London. Randall held the Wheatstone chair of physics and was director of the MRC unit, funded in perpetuity with the avowed intent of applying “The Logi of Physics to the Graphi of Biology”—in particular to the mechanisms causing division of living cells. In the 1940s it was still being debated as whether it was the nuclear protein, the DNA or both together that were instigating cell division. Randall was convinced by the work of Avery and others that DNA alone was the agent of division. Accordingly he had several avenues of research progressing in his laboratory concerned solely with DNA. Knowing that sperm heads were closely packed with DNA, he had directed me, as his Ph.D. student, to make flat flakes of rams’ sperm and expose them to x-rays, edge on, in the hope that the resulting diffraction pattern would reveal something of their DNA structure. The result was a disappointing, fuzzy fiber diagram. Meanwhile Maurice Wilkins had attended a lecture at the Royal Society by Rudolf Signer, a Swiss biochemist who had managed to extract DNA from calf thymus gland at a very high molecular weight—around 12 million. At the end of his lecture, Signer offered some freeze-dried samples of this sodium salt of the DNA, which Wilkins quickly accepted. Back in the lab he found that fibers drawn from a water gel of this material were highly birefringent. I asked him if I could try to get a diffraction pattern from a specimen of these fibers to compare as a gold standard with those from my various attempts to persuade rams’ sperm to lie flat. So Wilkins pulled the fibers varying from 5–10 µ in diameter and I wound them onto a paper clip. Testing the first specimen of 35 fibers with an x-ray machine produced a result not much better than my sperm flakes. This should not have been surprising since most of the atoms in the fibers were the same as the air within the camera. The next step was to displace the air with hydrogen. To monitor how much hydrogen I was putting into the camera, and the room, I bubbled it through water. This serendipitous act, to avoid an explosive atmosphere, allowed the NaP ion complex in the fibers to take up water and so form micro crystallites throughout each fiber. The result is shown in the Figure. When in the spring of 1950, I first saw all those discrete diffraction spots emerging on the film in the developer dish, it was a truly Eureka moment. I realized that if DNA was the genetic material then I had just shown that genes could crystallize. Wilkins reacted enthusiastically to this news. At this stage Alex Stokes taught me some crystallography and armed me with the concept of the sphere of reflection and reciprocal space. The measurement of layer—the line separation in the pattern shown in the Figure gave the C axis repeat of the unit cell. Trial and error assignment of HKL index values (reciprocal lattice points) to the other reflections, suggested that the unit cell was Monoclinic C2 with values of A=22.0 Å, B=39.8 Å, Beta=96.5°, C=28.1 Å. At the beginning of 1950, Randall must have been quietly confident that his lab was getting close to the “secret of life.” We had brought together a novel high intensity x-ray tube, kindly lent to us by Ehrenberg and Spear at Birkbeck, and a microcamera allowing us to obtain diffraction patterns from single fibers of NaDNA. This was something that no other lab was currently able to do. Randall’s response to this was to headhunt for an experimental scientist versed in using x-rays to solve the molecular structure of para-crystalline material, such as was our sodium salt of DNA. In late 1950 he found Rosalind Franklin, then working in Paris, and asked her to join us at Kings and lead the effort in solving the puzzle of our beautiful diffraction pattern. Later that year there was a meeting of Franklin, Stokes, and myself in which I was formally handed over to Franklin as her assistant, i.e., transferred from the Wilkins/Stokes team to work exclusively with her. In retrospect the absence of Wilkins in this meeting was crucial. He was away from the lab at this time. It left Franklin with the impression, subsequently and surprisingly confirmed by a letter from Randall, that she would be in charge of the work of solving the structure. I realized later that she was unaware of the special position of Wilkins vis-à-vis Randall in the structure and politics of the laboratories as a whole. Unfortunately Franklin thought that she was a senior post-doctoral fellow and completely independent. Wilkins assumed that she would freely interact with him, as did most other people in the lab. The seeds of conflict were sown, which caused a great deal of angst. In retrospect I should have realized this and tried to prevent this conflict. Early in 1951, Wilkins met James Watson at a conference where he had presented our work. Watson asked Wilkins if he could join the group at King’s but was rebuffed. Consequently, he went to Bragg’s unit at Cambridge. There he met Francis Crick who knew all about our work, as he was a close friend of Wilkins. Franklin joined the DNA group in early 1951. Her first directive to me was to make up a series of saturated salt solutions that would give a constant humidity to the hydrogen we bubbled through to displace the air in our camera. So we were then able to take the same specimen through stages of water content from dry (disorientated pattern) to 92% humidity and to do this with a single fiber. This painstaking experimentation I later realized was the hallmark of her science. She was able to show that NaDNA could exist in two stable forms, which we named A and B. We realized that all the published fiber diagrams up to now had been mixtures of these two forms. That I had produced a pure form of A with Maurice’s multifiber specimens was serendipitous. A result of just the right rate of flow of dry hydrogen through water was to give a steady 75% humidity. My only concern at that time was not to blow myself up by filling the lab with hydrogen and getting a spark from 50,000 volts on the rather old x-ray tube. As to the structure, it was obvious from the B pattern—the best we ever got was Photo 51—that at high humidity and therefore presumably in vivo, the molecule was helical. From Stoke’s theoretical math we found that the diameter was 20Å and the repeat distance was 34 Å containing 10 nucleotides per turn of the helix with a slope of 40°. However, Franklin was more excited by the crystallized gene structure shown in “A.” Her view was that although “B” was helical it did not necessarily follow that “A” was. Franklin and I convinced ourselves that we had so much direct structural information in the intensity and position of the diffracted beams, nearly a 100, that we should calculate a Patterson Function from the data. This would show helical or asymmetric chains without the need to build models. At this time we were summoned to Cambridge to see a proposed structural model that Watson and Crick had built. This showed the Na/P ionic atoms forming a central core and the sugar rings coming out to the bases on the outside. Franklin demolished this suggestion with gusto! Mainly because we knew the Na/P complex must be on the outside of the structure because the water went in and out so easily. As Crick remarked later, it was the only time he had seen Watson at a loss for words! With hindsight it is easy to see that the structure they had built was so rigid that it must be wrong. It is know that there are 3 billion base pairs in the human genome. At 34Å thick, this would mean a length of 102 cm, thus requiring great flexibility to allow folding of the structure to fit into the cell nucleus. So we returned to Kings and started with renewed vigor on our intensity measurements, correction factors, and Patterson function calculations. For us, model building was out. Bragg forbade Watson and Crick from any further model building. The DNA problem, it was agreed, belonged to Kings! However some months later, on learning that Pauling was actively thinking of DNA structure, Bragg lifted his ban on model building, and Watson and Crick began building models again, this time using our data as to helical radius 10Å, and to the number of nucleotides along the fiber axis per repeat interval, 10 in 34Å, and the space group of structure A, Monoclinic C2. This permitted Crick to rightly postulate two chains per lattice point related by a diad axis, i.e., one going up and one going down. When they added to this data, the specific pairing of the bases all fell into place. We were summoned once more to Cambridge. This time we were convinced. It was so elegant, it must be right. On our return to London Franklin and I examined our Patterson data and everywhere we looked we could see indications of a double helix. I think it is very sad that Franklin was never able to see the exponential mushrooming of molecular biology resulting from her work. I would love to have heard her opinion of the current controversy on the cloning of stem cells. The laws of the physical universe will always apply, and it is only our interpretation and use of the data that may be wrong. However, when experimenting with living material, even the protocol of the experiment may be questioned. I believe Franklin would have advocated a global approach to the regulation of such work. We are now facing direct manipulation of the evolution of our species and the creation of new transgenic life forms. A problem probably more important than global warming. Raymond Gosling, D.Sc., carried out research on the structure of DNA with Maurice Wilkins and Rosalind Franklin at King’s College in London, under the leadership of Sir John Randall.